More than 100 middle school students from Camden County participated in the competition at Camden County Technical School. Camden County Technical School junior Justin Harrison helps Carusi eighth grader Brendan Casuscelli assemble his team’s hot dog launcher. What do you get when you put hot dogs, tools and science together? A world of unlimited possibilities, and a gymnasium floor covered in hot dogs. More than 100 sixth-, seventh- and eighth-grade students from various schools in Camden County gathered at Camden County Technical School for the first ever CCTS Technology Challenge. The challenge was to build hot dog launchers and launch the hot dogs as far as they could go. One of the teams from Ann A. Mullen School in Gloucester Township came in second place and also won the Team Spirit Award. The mission of the CCTS Technology Challenge was not just about engineering, constructing and building, but to solve problems working collaboratively as a team. Hannah Allmond was on Team Tesla from Mullen School and said it was the best day. “It was so much fun,” she said. “I love science and engineering because you get to create whatever you want. “I think it’s pretty cool we can all build hot dog launchers, and it’s cool we can understand STEM and how it actually works in the real world,” said C.W. Lewis seventh grader Shannon Pinizzotto. 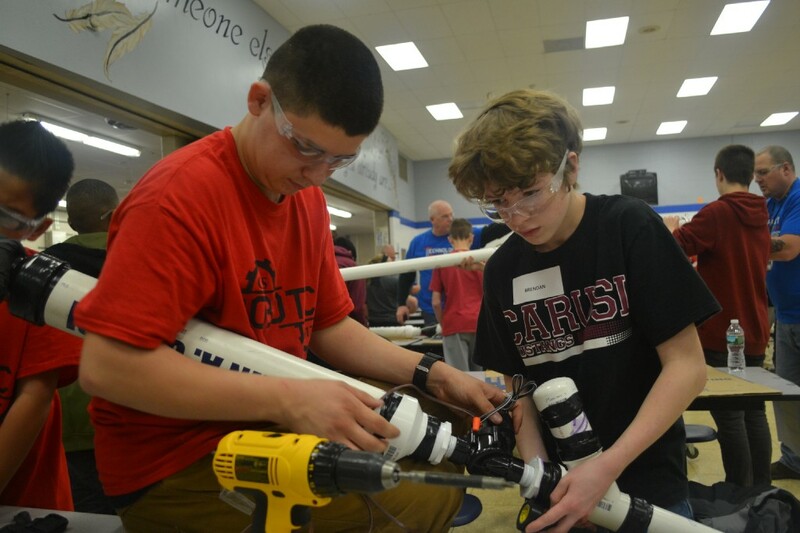 Twenty-five teams had three hours in the morning to construct the launchers out of PVC pipes. They were provided a packet of instructions and tools such as drills and wrenches. For some of the students, it was the first time they ever worked with tools. Cherry Hill’s John A. Carusi Middle School was one of the teams that participated, and eighth grader Brendan Casuscelli said the day was a learning experience for him. Students and teachers from Camden County Technical School assisted and helped mentor each team to help construct the launchers. Junior Justin Harrison was one of them, and he said he thinks with a challenge like this, these middle school students will be more prepared going into high school. All the teams competed in the afternoon. One by one, they inserted their newly constructed hot dog launchers into wooden frames and then inserted hot dogs before launching them into the air at targets set up throughout the gymnasium. More than 1,200 hot dogs were brought in for this event. Carusi STEM teacher Tom Kelly said he hopes his students realize anything is possible if they put their mind to it. “I’m hoping they see what they can do is possible, build their confidence and take these skills and bring them into the classroom,” he said. Matthew Dumele, sixth grader from Ann. A Mullen, had a smile from ear to ear as the day neared the end. He said he loved everything about the event, from creating with friends to learning about engineering and science.